Louisville is home to the Kentucky Derby and is the largest city in the state of Kentucky. 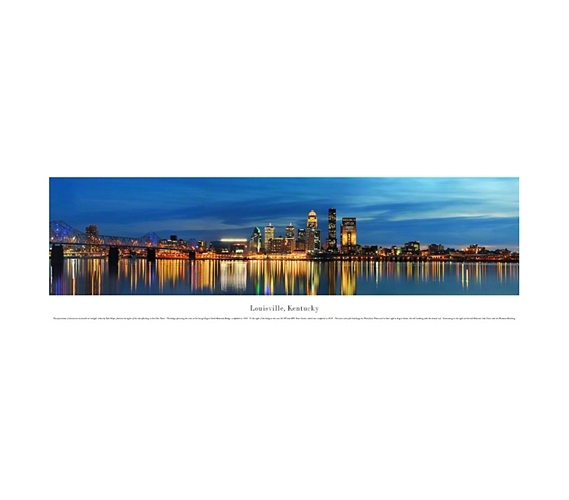 Louisville's visual splendor is captured marvelously in this Louisville, Kentucky - Twilight Panorama. This panorama is just what your college dorm walls need to look their best. Decor for dorm rooms should include dorm stuff that's more exciting than your everyday dorm supplies. Posters and magazine cutouts are fine, but takes things a step higher with these beautiful city panoramas. This panorama of downtown Louisville at twilight, taken by Rich Hoyer, features the lights of the city reflecting on the Ohio River. The bridge spanning the river is the George Rogers Clark Memorial Bridge, completed in 1929. To the right of the bridge is the new 22,000-seat KFC Yum! Center, which was completed in 2010. The twin red-roofed buildings are Waterfront Plaza and to their right is Aegon Center, the tall building with the domed roof. Continuing to the right are the tall National City Tower and the Humana Building. Louisville was named for King Louis XVI of France in appreciation for his assistance during the revolutionary war. This scenic city was founded by George Rogers Clark in 1778.